Libertarian Party presidential nominee Gary Johnson will rally supporters in Seattle on Saturday, one day after learning he won't be taking the stage later this month at the presidential debate. Libertarian Party presidential nominee Gary Johnson will rally supporters in Seattle Saturday, seeking to position himself as a credible alternative for voters who can’t stomach Hillary Clinton or Donald Trump. The appearance, though, comes a day after a major letdown for the campaign: Johnson will not be taking part in the televised presidential debate this month. The former two-term governor of New Mexico plans a free 4 p.m. rally Saturday followed by a fundraiser at the downtown Seattle Sheraton hotel. Johnson will be joined by his vice-presidential running mate, former Massachusetts Gov. Bill Weld. Adding a touch of local celebrity, former Nirvana bassist Krist Novoselic and comedian Drew Carey (a co-owner of Seattle Sounders FC) also will speak. The Johnson-Weld ticket is running a distant third in national surveys, averaging about 9 percent, according to polls tracked by the news site RealClearPolitics. But they cracked 16 percent in Washington state in a recent Washington Post poll. The commission that oversees presidential debates announced Friday it would invite only Clinton and Trump to the first presidential debate, Sept. 26. It excluded Johnson and Green Party nominee Jill Stein, because they have been polling too low. According to The Associated Press, the commission since 2000 has invited only candidates polling at 15 percent or above in an average of five polls. Johnson was at 8.4 percent and Stein at 3.2 percent. Johnson made headlines — and not in a good way — last week when he responded “What is Aleppo?” when asked for his position on the humanitarian crisis in the war-torn Syrian city. But Paul Addis, co-director of Johnson’s Washington state campaign, sees a bright side to the highly publicized gaffe. “I think that as far as his recognition goes it helped him,” he said. In an interview with KIRO radio’s Dori Monson this week, Johnson acknowledged he’d been confused by the Aleppo reference but said he had no excuses. “Look, I think probably 90 percent of Americans don’t know what Aleppo is but they’re not running for president of the United States, and I am,” he said. 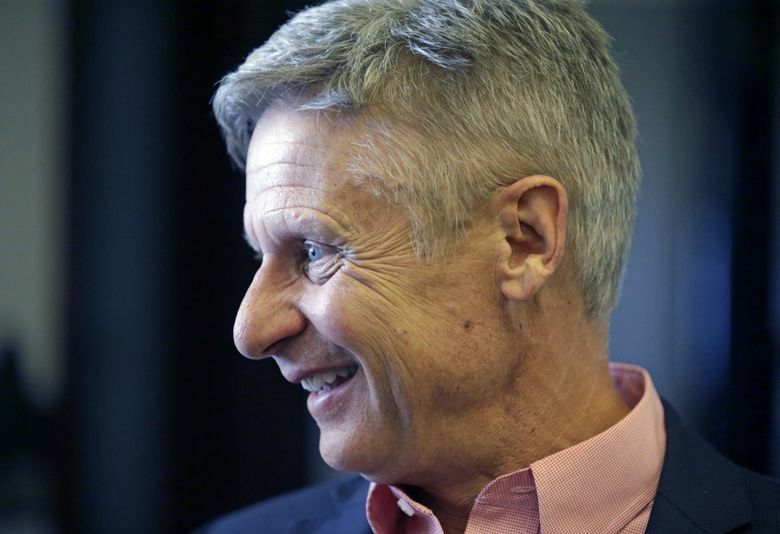 Both Johnson and Weld were Republicans when they served as governors — and much of the flirtation with the Libertarian ticket in this state has come from prominent Republicans embarrassed by their party’s nomination of Trump. Local GOP activists have helped launched a Republicans for Johnson/Weld campaign. Some of Johnson’s positions, like eliminating the federal Department of Education and support for privatizing government functions from prisons to health care, are in line with GOP small-government principles. But it’s not solely Republicans who are planning to vote for Johnson. Novoselic, for example, says he voted Democratic in the previous four presidential elections, dating back to Al Gore in 2000. This year, he finds both Clinton and Trump divisive and has been attracted to Johnson’s message and demeanor. Novoselic said that while he doesn’t agree with all Libertarian positions, Johnson is talking about issues — such as the national debt of nearly $20 trillion — that are being largely ignored in the nasty and personal Trump-Clinton battle. Novoselic argues a vote for Johnson in Washington state — which polls suggest is almost certain to go for Clinton — will send more of a message than just falling in line behind one of the two major parties. While Johnson’s beating Trump and Clinton in Washington is far-fetched, Addis said one goal for Libertarians here is to win at least 5 percent of the 2016 vote. That would grant “major party” status to the party and guarantee its nominee a spot on the next presidential- election ballot, in 2020.